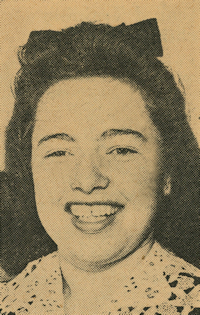 Obituary – Pogue, Dorothy June (Haynes) « Perry High School Alumni Association, Inc.
﻿- 17-year-old daughter of Mr. and Mrs. W. F. Haynes, was born on August 20, 1923, at Lindsay, Okla., and spent 10 years in the Lindsay schools before moving to Perry. She has held several offices in the Order of Rainbow and also belonged to the Queen Esther. She played third clarinet in the Perry Maroon band. Dorothy June collects photographs of friends as her favorite hobby. She will enroll at the Oklahoma A. and M. college next fall. Dorothy moved to Fort Collins in 1998, and became a very valued member of Victory Bible Fellowship. She was also a member of Red Hat Society. Prior to Fort Collins Dorothy lived in Colorado Springs where she was active in the Salvation Army Auxiliary and Pilot Club. Dorothy was preceded in death by her parents; brother, William F. “Billy” Haynes, Jr.; and husbands, John Wagner and James Pogue. Dorothy will be buried in Tulsa, Oklahoma.